It’s fall, y’all! [Full disclosure, I’ve been living in the South for five years but I don’t feel comfortable saying the word “y’all.” With my New York accent, it comes out like “yawl.” I have 100% claimed it when I write, though. I’m a Southern girl at heart, I guess.] 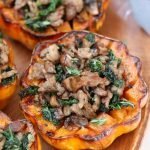 In any case, it’s fall, and I really love squash at this time of year, especially acorn squash. The flavor is so rich and sweet, not to mention they make the cutest little serving boats ever. 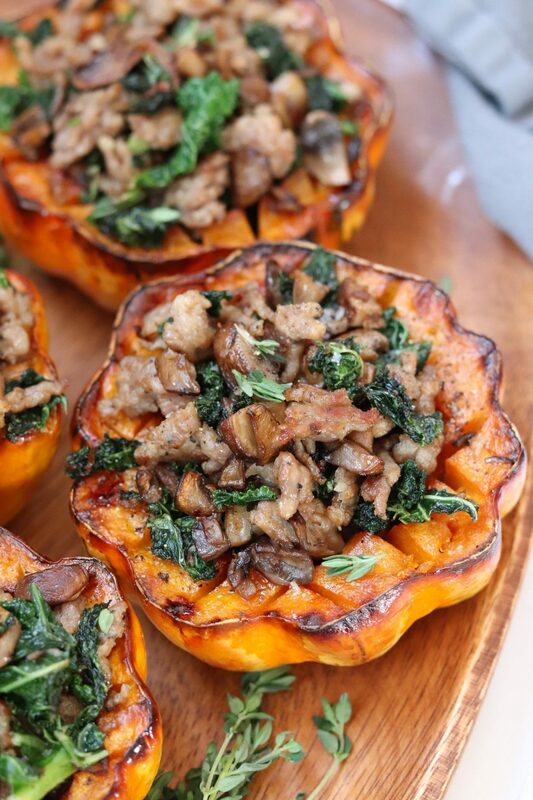 I’m so excited to share this recipe for Roasted Acorn Squash with Sausage, Kale & Mushrooms! Microwave each squash alone for about 1 minute. This softens it just enough to make it a little easier to cut. Even with the sharpest knives, squash are really hard. People sometimes don’t like to do this, because it won’t sit flat to function as a bowl to stuff the squash with other yummy goodness. The solution: Cut it sideways, roast it, and once it’s cooked and cooled a bit, you can easily trim the bottoms of each half so it sits flat. Use a grapefruit spoon to scrape and remove the seeds. The sharpened edges on the grapefruit spoon make this job like a thousand times easier. Score the flesh of the squash in a cross-hatch pattern before baking. This allows you to easily remove bite-sized pieces with a fork easily once it’s cooked. If you don’t do this, you’ll be man-handling your squash come dinnertime. Olive oil, salt and pepper (savory) OR melted ghee, maple syrup, and a touch of cinnamon (sweet). For the recipe here, choose oil, salt and pepper. Lay on a parchment lined baking sheet, face up, and roast at 400 degrees for one hour. If you have a particularly large or small squash, either add or subtract about 10 minutes and watch closely near the end of the cook time. Okay, back to it. Right now, I’m prepping to go out of town for Thanksgiving, so that means eating what’s left in the fridge and pantry, avoiding a trip to the grocery store at all costs. I had a few acorn squash to roast, so I did a quick search of what I had to see what I could use to make a meal. Usually when I forage in my fridge, I almost always come out with eggs and make a frittata using whatever extra veggies I have on hand. Not this time. Don’t get me wrong, I love eggs, but I just wasn’t feeling it. 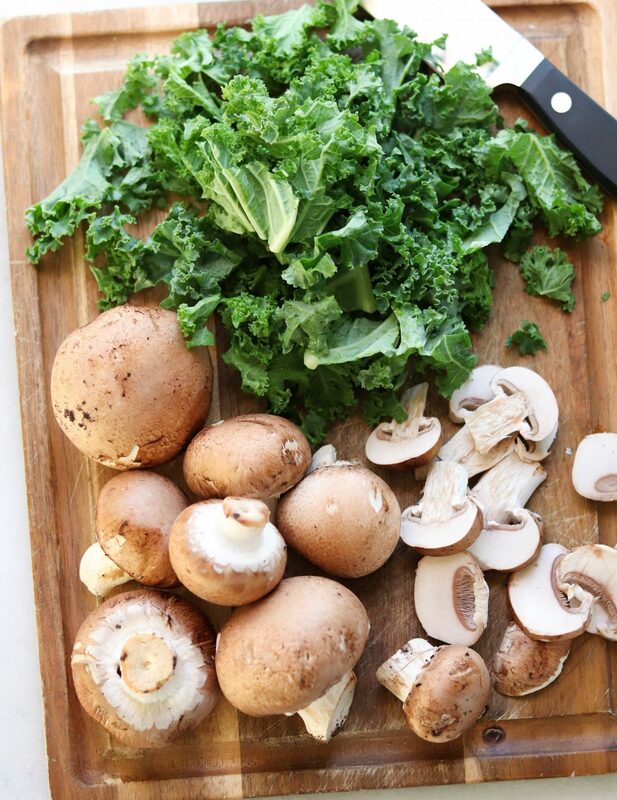 I found an 8oz package of baby bella mushrooms, ground sausage, and half of a bunch of kale. And man, the stars just aligned on this one, because it was good. Like, really good. I just love it when things work out so perfectly like that, don’t you? I couldn’t have planned it better if I tried. Here’s a pro tip for you: If your kids hate mushrooms as much as mine do, dice them up really small and sauté them with ground sausage. The texture is really similar! My five year old was spooning the sausage mixture into his mouth, barely swallowing before shoving more in. And as much as his table manners are lacking, I love to see him enjoying the food I make (especially when I sneak him extra veggies, muah ha ha). This meal is made of literally five ingredients (besides the oil, salt and pepper, I mean). Does it get any easier than that? And hello, it’s unbelievably flavorful and filling. It’s just one of those meals that can warm you up when you come in from the cold, nose and cheeks still rosy. And once the acorn squash are roasted (which you can do in advance, by the way), the whole meal comes together in about 10 minutes. My family gobbled this up! My husband just kept repeating, “This is SO good.” And that makes me feel good. 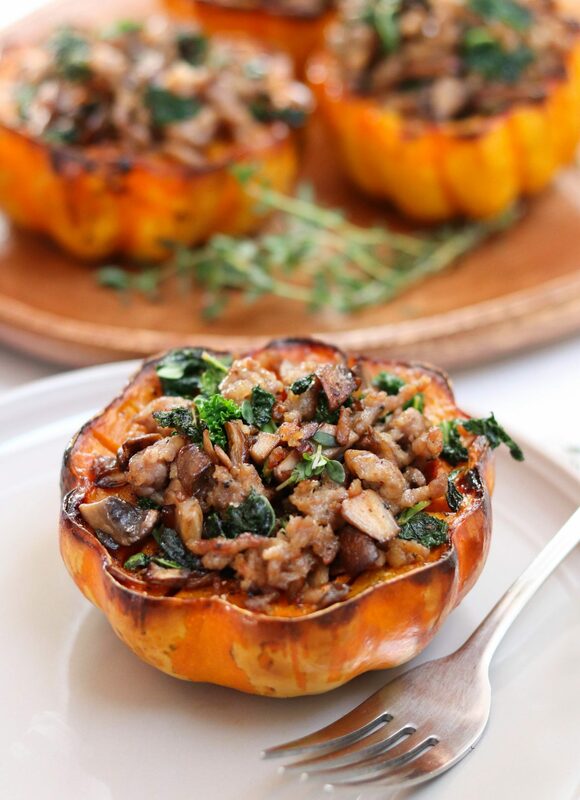 Hope you enjoy this Roasted Acorn Squash Stuffed with Sausage, Kale & Mushrooms as much as we did! 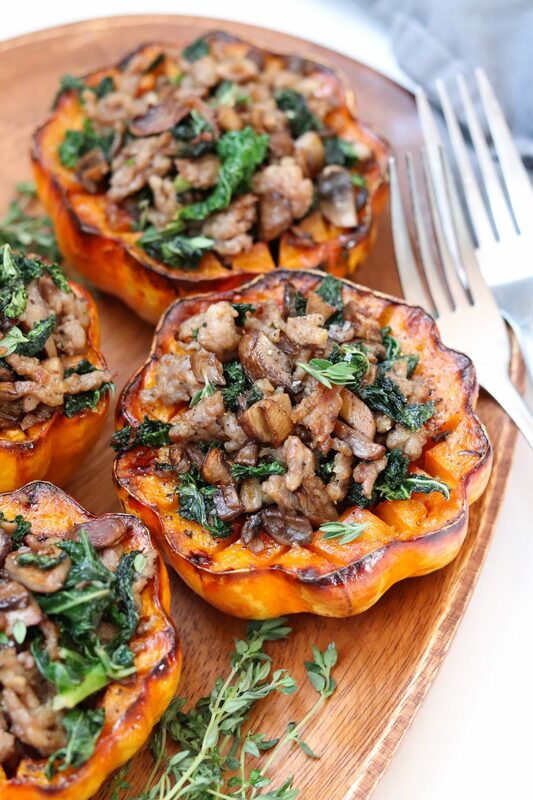 An absolutely delicious fall dinner – Acorn Squash is roasted and stuffed with sausage and sautéd mushrooms and kale. Whole30, Gluten Free, Paleo. Slice the acorn squash in half and remove seeds (see HOW TO COOK ACORN SQUASH for tips above). Lay each squash half on a parchment lined baking sheet, face up, and drizzle with oil. Sprinkle with salt and pepper. Bake for one hour. If your squash are large or small, either add or subtract about 10 minutes and watch closely toward the end of cook time. While the squash cooks, brown the sausage in a large skillet over medium heat for about 3 minutes, breaking apart as it cooks. Spoon the sausage into a bowl and set aside. Don’t wipe out the pan. 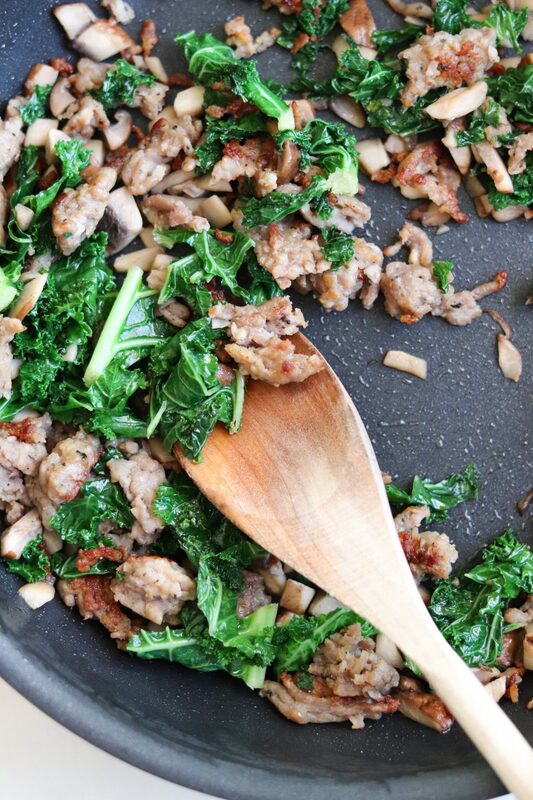 Add the mushrooms to the skillet and sauté in the sausage grease, stirring occasionally, until browned. Stir in the kale and sautée together, stirring occasionally, for about 2 minutes. Season to taste with salt and pepper, and sprinkle in fresh thyme. 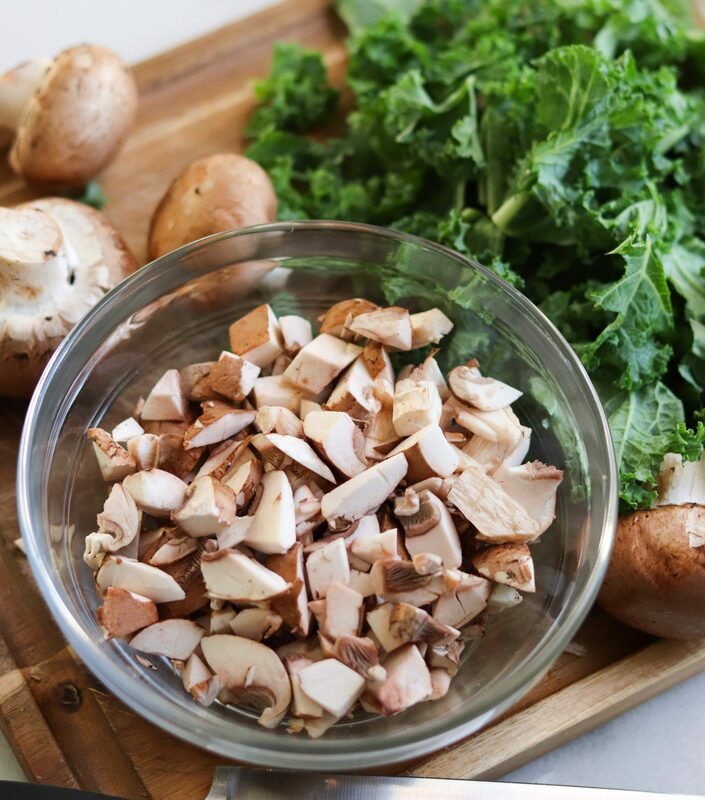 Looking for more gluten free / paleo / Whole30 family-friendly dinner options? Check out my recipe for Orange Sesame Chicken & Broccoli (it’s a fan favorite!). I feel the same way. I can’t say “y’all” yet either! It must be a northern thing! Haha! I’m glad I’m not alone!